I’m no car aficionado, but I certainly understand the importance of proper auto maintenance. Let’s take wheel alignment for example. Hitting a large pothole head-on or hitting a curb may cause more than a loud thud. It could throw off your car’s wheel alignment. Improper wheel alignment can cause issues with how your vehicle handles — which could create a safety hazard — and can also negatively impact tire tread and gas mileage. Collisions, even slight ones, can take a car out of alignment. Hitting stuff in the road is a big concern. Curb shots often take a car out of alignment but don’t get checked since the visible damage appears to get absorbed by the tire. Would you know if your car’s alignment was off and whether it needed to be repaired? Tires that are abnormally worn could be a sign your car’s alignment is off track. Common tire wear comes from a lack of tire rotation. Unlike wear from poor alignment, though, normal tire wear typically occurs on the front tires and shows up as cupping on the outside edges. But if the alignment is off, other wear patterns can show up, such as excessive wear on the inside edge and/or the outside edges of tires. If the steering wheel pulls to one side or the other, or isn’t level when driving, it could be an alignment issue. The right way to do an alignment could be called a four-wheel alignment. Once the vehicle is put on an alignment machine, and all four targets are mounted on wheels and calibrated, the first angle the alignment machine is looking for is thrust angle alignment. That angle is the direction the rear wheels are pointing from the center of the rear axle straight through the center of the wheel. This measurement is what the alignment is based on. Normal alignment maintenance should occur every 10,000 miles, more often if driving frequently over rough terrain, hitting pot holes or being involved in accidents. Right about now you are wondering why I, a Chiropractor, am bothering to write about wheel alignment of a car. Well, I had an interesting discussion with a friend I play tennis with today. She came off the court during a short break complaining that her right leg was numb and that the top of her foot was sore. She proceeded to tell me that it (this numbness and pain) happens randomly, but frequently and seems to resolve on its own after a period of time. She then told me she thought it happened sometime after child birth (20 years ago) from carrying her sons on her right hip. She said that she discussed this with her MD, but he said (and I quote) “it wasn’t worth fixing”. I was appalled and it apparently showed on my face. I asked her if she felt it was worth fixing. She responded that it wasn’t bad enough for surgery, at least not yet. “WOW!”…I did actually say wow. I then explained that this was not something she should blow off…not something that she should allow to get bad enough to require surgery, and that she really should consider doing something to correct it now. 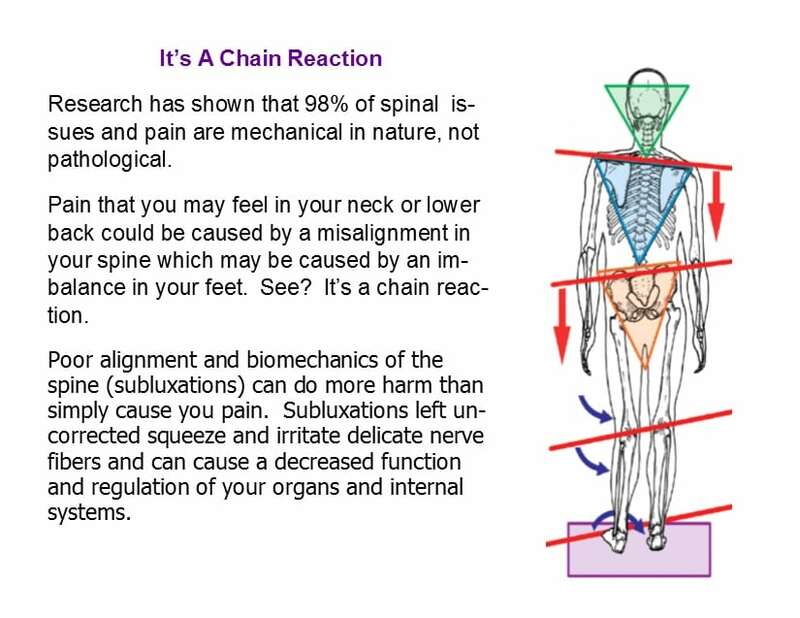 I explained that the kinetic chain…how the foot bone is connected to the ankle bone and the ankle to knee, hip and back AND if she’s out of alignment anywhere in the chain that it puts pressure on her joints and nerves and causes much greater problems than just her symptoms. I told her she needed a professional’s help, more specifically, a Chiropractor’s help to resolve the alignment problem. She didn’t seem to understand, so, as I am the queen of analogies, I gave examples of how poor wheel alignment on her car could cause parts on her car to wear unevenly or prematurely. The same is true in the human body. Poor alignment of the skeleton causes all sorts of problems…everything from bunions, to knee or hip problems and spinal issues like disc injuries, Sciatica and even neck pain and headaches. Your nervous system communicates with, controls and coordinates every part of your body via electrical impulses over nerves. Most of the time these vital messages get to and from their destination with no problem, but sometimes they are blocked or diminished due to poor alignment of the spine or other joints of the body. This can result in abnormal function of organs, sickness and even disease, not just pain or numbness. The symptoms are just the warning sign that something is wrong, the way a shake, rattle or indicator light alerts you to a problem with your car. Your skeleton must be aligned properly in order for 100% of the nerve impulses to flow over the nerves into your body parts. Any blockage with these nerve impulses due to misalignment is called a subluxation. Doctors of chiropractic work to align the skeleton back into normal position restoring the flow of life-giving nerve impulses into your body. Healing takes place when the brain can re-establish life-giving energy via these nerve impulses. But how did your spine and joints get subluxated (out of alignment) in the first place? Ever step in a (pot) hole and twist your ankle? Sleep wrong? Get into a car accident? Fall down? etc… Are you aware that you could be subluxated and not even know it? After all, only 10% of all your nerves actually transmit pain signals, so if you are relying on pain to tell you there’s a problem, you might not catch it until it’s too late. Or, are you like my friend who is just ignoring the symptoms? Well, that’s like having an indicator light blinking on your dash board and just ignoring it. And symptoms of organ dysfunction like: heart palpitations, heartburn, indigestion, foggy thinking, hormonal issues, constipation, colic, ear infections to name just a few. Like your car, your house, your teeth or even your hair, isn’t your skeletal and nervous system, worth a bit of maintenance? … And, that’s why I wanted to discuss your auto maintenance today. ⟵Weight Loss: One of the Most Significant Things You Can Do to Improve Your Health!